Follow these five simple rules to keep your curls clean, fresh, and Moxie-licious! Click a tip below to reveal more. #1 Do not over-wash your hair! Get Clean!™ No-Foam Shampoo, allows you to remove excess product and dirt without stripping your hair's natural oils, which are essential for keeping your curls shiny, smooth and healthy. Thick, dry, curly hair should be washed at most once per week, while fine, curly hair can be washed more frequently. Get Fresh!™Shampoo is a great sulfate-free alternative for curlies with finer, less dry hair. Make sure that you condition your hair with either Featherweight™ (for finer hair) or Intense Quench™ (for thicker, dryer hair) at least once per week. 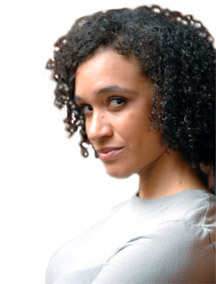 Curly hair is very susceptible to environmental damage and needs to be treated gently in order to thrive. If you have thick hair, don't be stingy with the conditioner - your fingers should slip easily through your hair. #3 Never comb or brush your hair when it is dry. When your hair is wet, your curls naturally coalesce into spirals or waves. As long as your hair remains wet and is protected with a conditioner or styling product, such as Intense Quench™ or Everyday Leave-in™, you can gently loosen snarls and tangles without disturbing the curl pattern. Once your hair begins to dry, combing or brushing will separate curls and cause hair to become frizzy. Curls should be finger combed and defined while still soaking wet. If you have a lot of hair and need extra time to style your entire head, just spritz hair with water to keep it pliable and smooth. #4 Seal moisture in to keep frizz out. The curved structure of curly hair leads to friction between individual strands. This friction in a primary cause of what we see as frizz: individual strands of hair standing apart from one another. Coating the hair with a leave-in styler (whether a cream or a gel) when it is still wet reduces frictional forces, seals moisture into the hair shaft, and helps to prevent frizz. Whether you use Mane Tame™ for fine hair, Just Gel™ for moderately thick hair, or Shape Shifter™ for very thick hair, make sure your styling routine includes a product that will give you some measure of frizz control and definition. For locked down, zero-frizz curls, Hold Up™ Defining Serum works for all hair types from fine and wavy to thick and curly. #5 Tight curls need oil! If you have curls that tend to feel silky and smooth, chances are that you have fine, looser curls that are naturally coated with the oil produced by your scalp. The curlier and courser your hair, the harder it is for the sebum produced in your scalp to coat your hair strands. Once your hair is wet, it cannot absorb oil as easily (oil and water don't mix, right?). So, if you have very dry hair, it helps to apply an oil-based product, such as Twist Mist™, Hair Bling™, or Emollience™ before you wet your hair. Of course, these products can also be applied to wet hair, but the effects will be somewhat diluted. 1) After applying a liberal amount of your favorite Moxie styler, such as Shape Shifter™, Lux Locks™, or Oasis™ Moisture Gel, to soaking wet hair, very gently begin working your fingers through your hair to separate the individual curls*. 2) Use your fingers to smooth each curl from root to tip. This will help further define your natural curl pattern and ensure that the styling product thoroughly coats and penetrates each strand. 3) Finger twisting each curl will provide extra definition and help transform kinks and frizz into silky smooth spirals. Finger twisting is easy – it’s basically like twirling your hair as you would while daydreaming – and is the best thing you can do to dramatically reduce volume, increase shine, and decrease frizz. Best of all, the more you do it, the more your hair will coalesce into spirals on its own. * What we call a ‘curl’ is a group of hundreds of individual hairs that naturally tend to clump together to form a unique ‘s’, ‘c’, ‘or ‘z’ pattern.